Is Nicaragua safe to visit right now? That’s a question we’ve been asked a lot over the past two weeks. Nine days ago, as Nicaragua burned and violence erupted, I compared the situation to the Arab Spring of 2011. That comparison drew criticism from many, both inside and outside Nicaragua, but I stand by it. The Ortega regime was using Middle-East-strongman techniques to repress its own people. It wasn’t meant as an insult and it wasn’t meant to either disparage the situation in Nicaragua or to blow it out of proportion. I’m aware when people think of the Arab Spring in 2018, they think of Libya or Syria, two failed states wracked by war and chaos. But I never meant to compare Nicaragua to those countries. What I was comparing Nicaragua with is Tunisia. The Arab Spring started in Tunisia in December 2010 when a street vendor called Mohamed Bouazizi had the electronic scales on his fruit cart confiscated by municipal authorities in his hometown. The authorities wanted a bribe, and Bouazizi had no money. Afterward, Bouazizi petitioned the local governor in his town to ask for his scales back. The governor refused to see him and so Bouazizi went outside, doused himself in gasoline, and set himself on fire. An excessive reaction, granted, but a reaction rooted in years of taking crap from an undemocratic and corrupt government. Okay, I realize no-one in Nicaragua set themselves on fire over the INSS reforms. But they took to the streets over a relatively minor issue that soon became overwhelmed by a host of other issues. What started small turned into a roar of anguish over corruption, injustice, and state-sponsored violence. The regime itself came under scrutiny. For over a decade, Nicaraguans watched their country slip into a dictatorship. The INSS reforms were the breaking point. Enough was enough. My point is, behind every revolution or protest or political change, there is a spark that starts the fire. The fire itself could be a slow-burn or a blazing inferno, but it always starts the same way. Even in the UK, the beginning of the end of the Thatcher era in the 1980s started with the poll tax riots. That was the spark there. It’s the same all over, whether in London, Tunis, or Managua. There is always a tangible moment when simmering resentments come to the boil. And that is what Nicaragua in 2018 and the Middle East in 2011 have in common and why I stand by my observation. How it all plays out is another question altogether. So how is it playing out in Nicaragua right now? This week things are quieter than last week, a good thing, although the death toll from last week’s carnage sits somewhere between forty and sixty. 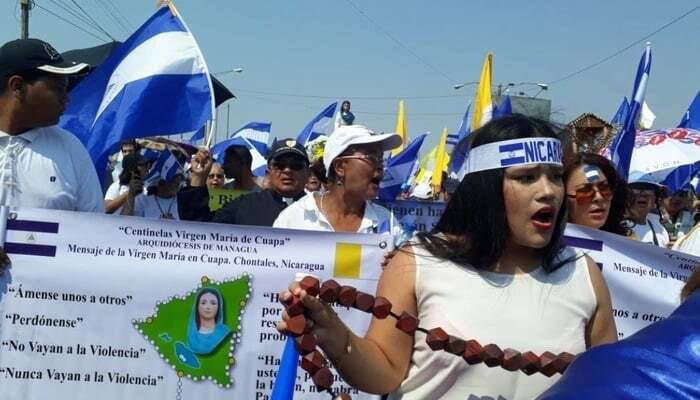 The big test was on Saturday, when a massive “Peace and Justice” march against the regime, organized by the church, took place in Managua. blue & white and yellow & white flags covered the streets today. With an estimated 150,000+ people in attendance, it was a beautiful expression of freedom, with no violence. Similar, smaller gatherings around the country also took place without incident. On Monday it was Ortega’s turn when he held a rally in Managua for those who’d remained loyal to him, to prove he’s not hated by everyone. Ortega’s rally was much smaller than its anti-regime counterparts on Saturday, but still considerable, especially when you count all those bussed in government workers forced to attend. 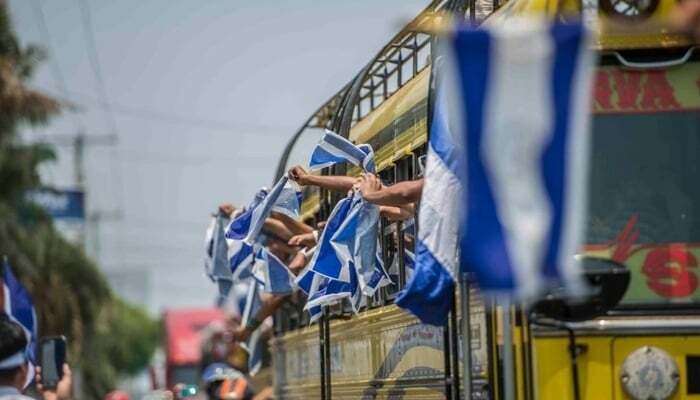 And that’s how it’s playing out in Nicaragua right now – rallies and counter-rallies. This is a million times better than the alternative we saw last week. Whether things continue this way is uncertain. The church is brokering negotiations – a “national dialogue” – between the regime and the protesters. Brenes also gave the regime one month to find common ground with the protesters. The thing is, what will those opposing the regime settle for during this national dialogue? Will it be for democratic reform? Will it be for Ortega to step down after his present term? Or will it be for Ortega and his wife to step down right now and force early elections? There are many who will settle for nothing less at this point. Either way, Ortega’s grip on power in Nicaragua is tenuous, no matter how many rallies he has. When senior members of the church come out against him, it’s more than likely game over in the long-term. With all this in mind, back to the original question. Is Nicaragua safe to visit right now? I know, I know. I’ve been skirting this question. A week ago I would have said no way. In fact, I did say no way, even though many parts of Nicaragua stayed safe during the worst of the violence. 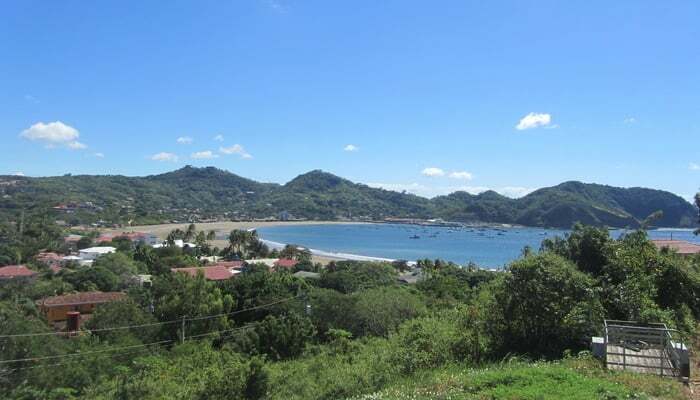 San Juan del Sur, for example, Nicaragua’s main beach town and tourist/expat Mecca, experienced no violence. 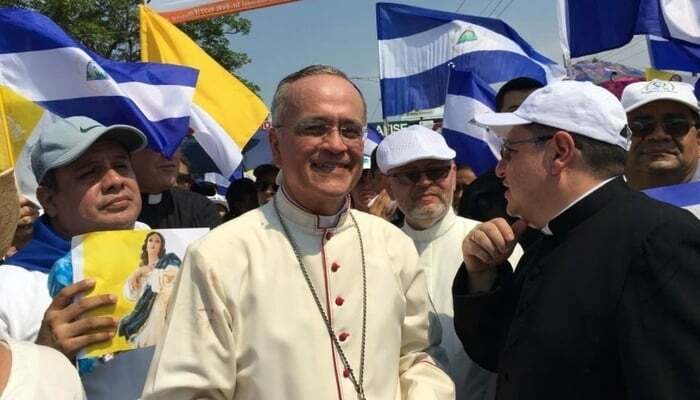 This week though, I would say a cautious yes, Nicaragua is fine to visit again, at least during Cardinal Brenes’ one-month timeframe. The US State Department and the British Foreign Office do not share my opinion. They recommend either not traveling to Nicaragua at all, or only traveling for essential reasons. The Canadian Department of Foreign Affairs seems to be a little more sanguine, but not much. Now things could change in a heartbeat. Ortega might pull his thugs out onto the streets again if things don’t go his way during the dialogue. The protesters might lay down conditions too tough for Ortega to swallow. They might not offer him a face-saving way out which could lead to more violence. But if you’re thinking of coming to Nicaragua right now, if you’re staying at the beach, you’ll be fine. If you’re elsewhere in the country, as long as you steer clear of demonstrations, I’ll go out on a limb and say you’ll be fine too. The roads are clear again and life, at least on the surface, is more or less normal. That said, you’ll want to ask yourself about the atmosphere in the country. That’s why I said, “at least on the surface, life is normal”. I mean, is it appropriate to be partying and making merry and being a tourist amid such tension? Last weekend, for example, the famous Sunday Funday Pool Crawl in San Juan del Sur was due to celebrate its fifth anniversary with a massive humdinger of a party. They ended up canceling, the right decision in my view. The optics of holding such an event at a time like this, when the country is grieving for the dozens lost last week, were not lost on them. Time and place, you know? Time and place. Even if your physical safety isn’t in jeopardy, it still might not be the best place right now unless you have the skin of a rhino and don’t care what people think. Just my opinion here. Time and place, remember? The flip-side is now more than ever, local people need the financial support that comes from tourism. As I pointed out last week, Nicaragua has spent years trying to throw off its sketchy image. Recent events do not help that image one bit, and times will get hard for many in tourism. The best advice when traveling to Nicaragua at the moment is to be aware. As of right now, most of these groups are talking about general life again rather than the political situation which is a good thing. Also get on Twitter or Reddit and check out what people are saying. ⬆️ click this hashtag and see what is happening in Nicaragua. Raise awareness so others may become aware. Please retweet and like. People need to know the hardships others in the world are facing right now. It’s hard to predict how all this will end up. Ortega has a month to deliver something that works for the people. Can he do it? Personally, I reckon Ortega is kaput. Whether he steps down immediately or offers democratic reforms and a pledge to see out his term and then retire, I don’t know. Whether I’m being optimistic, I don’t know. Whether seeing out his term and retiring is enough to appease the Nicaraguan people and the families of those who died last week, I don’t know. But I don’t see another civil war in Nicaragua. I don’t see a return to the bad old days. What I see are mass strikes and peaceful demonstrations much like Tunisia or, if you’re sick of the Arab Spring comparisons, Czechoslovakia’s Velvet Revolution. Take your pick. Whatever comparison you prefer, that is what will bring down Ortega if he doesn’t deliver during these talks. Nicaragua: Is It The End For President Ortega?